The Emergent Mind of City (EMC) project has been inspired by Leonardo da Vinci’s “City of Water, Design of City as an organism.” A city is an evolving creature with a very complex system that comprises men and systems like various organizations. In the EMC project, we look at the contemporary city in a data-flow, instead of water-flow, perspective. In the human body, afferent and efferent neural transmissions among nerves enable various organs to work as one inter-connected organism. If the city is viewed as a human body, the neural transmissions can be likened to the data flow of our time. However, if we consider the whole of data emerging daily in the city, it is an opaque, tantalizing, floating chaos. The data only assumes meanings as it is arranged and categorized in light of news, issues, and opinions. EMC specifically focuses on three flows of “Fringe” data: ‘event,’ ‘feeling,’ and ‘appearance’ data. When perspectives and meanings are projected and focused on an event, ‘News-network’ emerges; on a feeling, ‘Emotion-network’; and on an appearance, ‘Image-network’. A news-network that extracts meaningful structures from the meaningless flow of event data represents a flow of words that conceptualizes the city, and reveals the collective intelligence. An emotion-network, consisting of emotion data, is both a flow and a collective emotion that endow an identity to the news. We searched over tweets in Twitter for emotional words related to current news to create a network out of them. Then, how does the city expose its embodied mind? 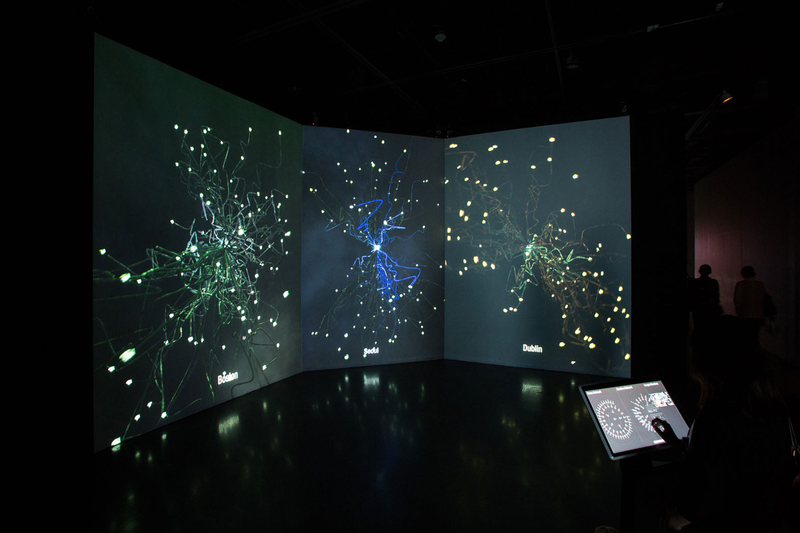 Through its hybridizing a microindividual-perspective and macro-social-minds, EMC creates the ‘Virtual Mind Neuron’ of cities (Boston, Dublin, Mumbai, Seoul…) and visualizes real-time mind of cities related to specific issues. ASIA2013_Kim_EMC from ACM SIGGRAPH on Vimeo. Your browser does not support HTML5 audio, but you can still download the audio guide.